CardPool is relatively new and has only been around since 2009, but already received good reviews and was mentioned by many brands, including NBC, CNN, Fox News, ABC, New York Times and the Wall Street Journal. While many times selling an unwanted gift card is so simple that you can count to 10 and complete the selling process, selling an Amazon gift card, unfortunately, isn’t quite as easy. Many online gift card exchange sites, where you can sell gift cards from different retailers and even get one check for their combined sell price, do not offer to buy unused Amazon gift cards. However, a little extra effort can help you not only sell your Amazon gift card for cash, but get its FACE VALUE in return, which is a rare thing in the online marketplace of second hand gift cards. While it does take more effort to sell on eBay than to use a gift card exchange website, you can make a little extra by doing so. In order to make sure that your listing will work and attract lots of bidders (or just one, if you choose the “Buy Now” option instead of the “Auction” format), have a quick look at how others are structuring their listings, what they are including and what terms are they applying to the sale. For example, many gift card sellers on eBay don’t send the gift card right away, as a mean of precaution. Dishonest buyers can get your gift card and then try to get their money back. Another thing you should be aware of is that you should mail the card to the buyer, not email him with the PIN. If you prefer sending the PIN, you should make sure that you do not place your listing in a category that requires the shipping of physical products only. 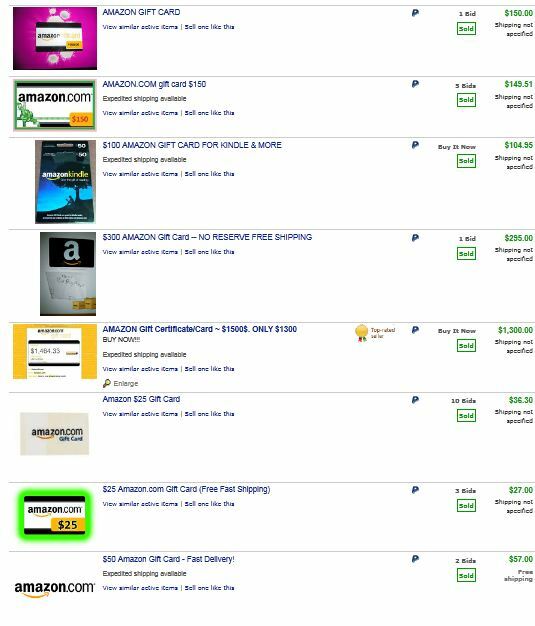 As you can see from this eBay screenshot, Amazon gift cards are in demand and sometimes you can even get the full amount of your card. If you offer free shipping, which is a good way to convince buyers to bid on your card, then make sure to write it in big letters within your listing. If your card comes with a branded envelope or if you ship more quickly than other sellers, mention these things as well when writing your auction. Additional tips and advice on monetizing your unwanted gift cards can be found here.